In an ongoing battle for the Latino vote, the 2016 Democratic presidential candidates held their own quasi-debate on immigration and refugee policies this week. Former Secretary of State Hillary Clinton, Vermont Senator Bernie Sanders and long-shot candidate former Maryland Governor Martin O'Malley each addressed pro-immigrant activists in New York to defend their records, while calling out their opponents for failed opportunities. In her address Monday, Clinton said the United States owes a "debt of gratitude" to the millions of immigrants who have contributed to its economy, and argued that the U.S. could add "hundreds of billions of dollars" more to its GDP by passing comprehensive legislation. 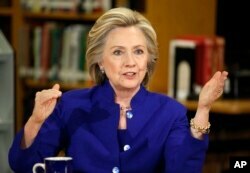 "Not a single Republican candidate — not one — clearly and consistently supports a real path to citizenship," Clinton said. "Senator [Marco] Rubio actually helped write the 2013 immigration bill. Now he renounces it. They're all moving toward the extreme and away from the rest of America." FILE - Democratic presidential candidate Hillary Clinton speaks at an event at Rancho High School, May 5, 2015, in Las Vegas. Unlike Clinton, who focused most of her attention on the Republican field, Sanders and O'Malley both centered on their Democratic rivals during their addresses Tuesday. On 2014's issue of unaccompanied minors crossing into the U.S. from Central America to escape crime and lack of opportunity, Sanders took aim at Clinton. "I was appalled that so many voices, including some within the Democratic Party, were insisting that large numbers of immigrant children at the border, caught in a humanitarian crisis, be sent back," Sanders said. "The United States has an international responsibility to children and families seeking refugee status." FILE - Democratic presidential candidate Sen. Bernie Sanders, I-Vt., speaks at a campaign rally in Portland, Maine. Clinton has defended the policy of returning minors, arguing it would deter families from sending their children alone on a dangerous journey. O'Malley, who trails both Clinton and Sanders, used the platform to tout his own record on immigration reform as governor of Maryland — the first state to pass the DREAM Act by popular vote for undocumented immigrants. He scolded his Democratic rivals for placing politics before principle. "We're not going to achieve the deeper understanding necessary to pass comprehensive immigration reform or to shut down the deplorable practice of these expanding immigrant detention camps in our country by taking our cues from our pollsters; by waiting until something is safe to say before we say it," O’Malley said. FILE - Martin O'Malley speaks during a Democratic presidential primary debate, in Des Moines, Iowa, Nov. 14, 2015. O'Malley challenged Sanders in particular for voting against a comprehensive immigration bill in 2007. 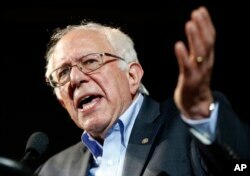 Sanders, who has since reversed his position, argued at the time that the bill would decrease wages for low-income workers. All three candidates spared no expense in their criticism of Republican candidate Donald Trump. Sanders called Trump's rhetoric against immigrants and Muslim refugees "xenophobic and racist," while O'Malley called him an "immigrant-bashing carnival barker." Clinton, for her part, accused Trump and others of "stoking the fears" of Americans who already are fearful of future attacks in the country. Trump currently leads all national primary polls with 33 percent support among Republican voters and an average spread of 17 percent over his number two rival, Ted Cruz. Trump has been a vocal opponent of granting citizenship to undocumented immigrants. In a confrontation with Univision anchor Jorge Ramos earlier this year, Trump defended a plan calling for the deportation of the estimated 11 million undocumented immigrants residing in the United States. When Ramos asked how he was going to do it, he responded, "In a very humane fashion."